“When I was with him, it was as though I was under some sort of spell,” recounted one of the victims of master seducer, hypnotist and heartless killer Joseph Clarke. “I couldn’t help myself,” she added. “I used to find myself feeling sleepy when he looked closely into my eyes, as if my senses were swimming. I couldn’t resist him because he made me feel I didn’t want to. I’d do anything he suggested. I gave him money whenever he wanted it. I was quite ready to leave home and go away with him.” Fortunately, she was able to break the spell Clarke had over her. Others weren’t so lucky. In this issue’s story “Liverpool’s Murderous Hypnotis,” we offer the full, extraordinary story of the Norfolk-born 1920s criminal who operated between England, America and Canada. Don’t miss it. 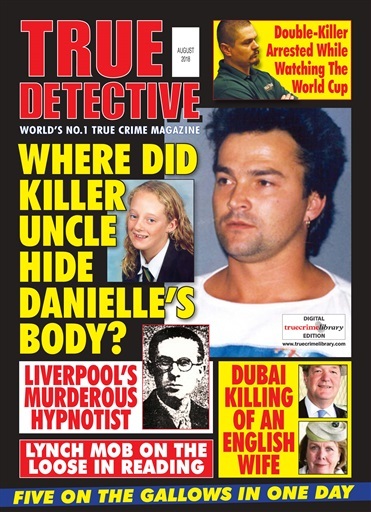 Crimes That Made The Headlines – “Where Did Killer Uncle Hide Danielle’s Body?” takes us back to 2001 when 15-year-old Essex schoolgirl Danielle Jones disappeared and hundreds of volunteers joined the search to find her. Tragically, the youngster’s disappearance subsequently became a murder inquiry – but the one man who knew what had happened to her was remaining tight-lipped. Finally, with football fever still ongoing, don’t miss “Double-Killer Arrested While Watching The World Cup.” Dave Verbist knew it was time to quit Spain – but fortunately the Spanish authorities were on to him. 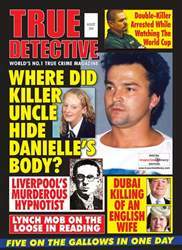 * Crimes That Made The Headlines: Where Did Killer Uncle Hide Danielle’s Body?